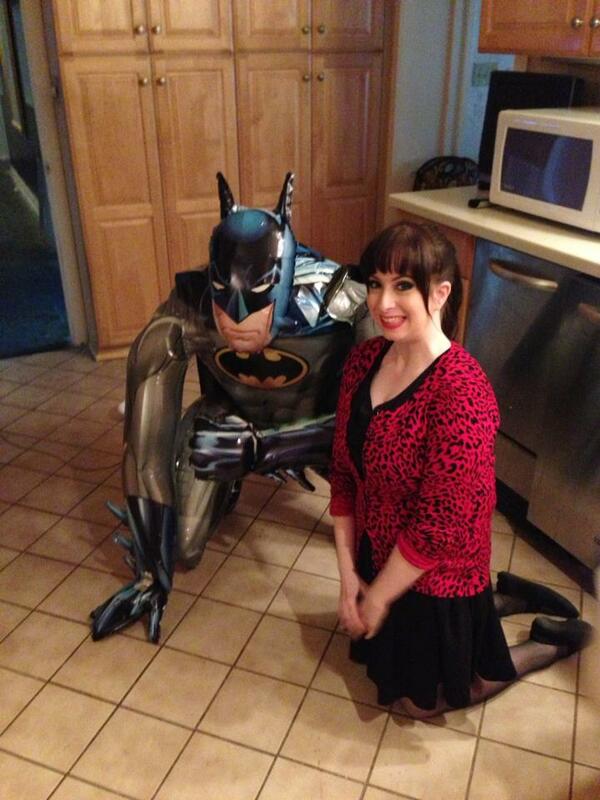 Today comic shops across America are celebrating 75 years of Batman. Batman is without a doubt one of the most recognizable comic book characters in history, and almost all of us reading this blog are fans of his. He doesn’t need any kind of introduction. After all, he is the Goddamn Batman. For my 27th birthday, my dad bought me this fantastic balloon. My obsession with Batman began when I was very young. I remember watching the Adam West show after pre-school every day. I frankly don’t remember a time before Batman. When Batman Returns hit theaters in 91 my dad deemed me old enough to see the movie in theaters, much to my mom’s protests. After that I was officially hooked. I was Batman the following school year (first grade! ), broke my Batbelt halfway through the day and cried about it (seriously ugly sobbing) because you can’t be Batman without the belt. The funny thing is, I’ve never followed the monthly Batman comic. I read Catwoman, Batgirl, Batman Adventures, even Batman graphic novels. But never followed the main Batman title. To this day I don’t, and I don’t know why. I’ve always been attracted to the other characters, namely Commissioner Gordon, Batgirl, Poison Ivy and Catwoman. They’re much more complex in my opinion, and I relate a great deal to Barbara. Hey I got the symbol tattooed on me! Over time the other movies came out, and I saw all of them. I followed every cartoon show, every spin off series (Birds of Prey) and even saw Catwoman. Needless to say the franchise means a lot to me. It was my first foray into comics. He is my first superhero. It even made my dad and I closer as he too likes Batman. In fact, our vanity tags on our cars are Batgirl and Dark Knight (it’s abbreviated). My mom’s legal name is even Robin. So maybe it’s more of a lifestyle for me at this point. 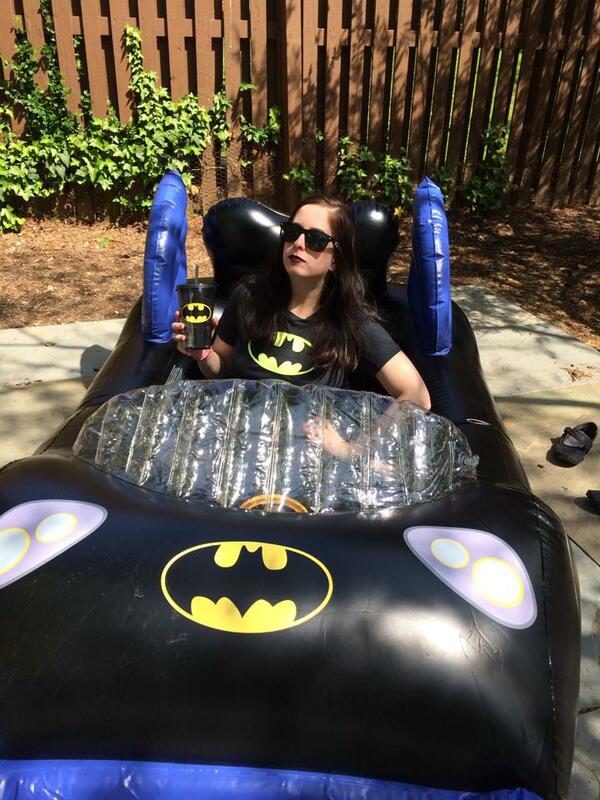 Check out my sweet Batmobilepool. I’m nearly 30, and I don’t see my love of this character dying anytime soon. He’s been around for 75 years, and here’s to another 75! 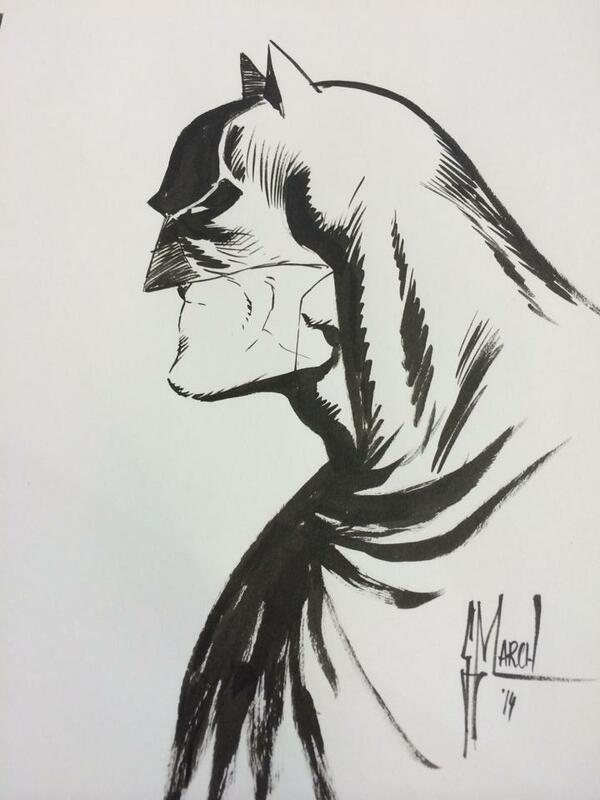 My Batman sketch done by Guillem March! So dear readers, what does the Dark Knight mean to you? This entry was posted on July 23, 2014 at 5:37 pm and is filed under General. You can follow any responses to this entry through the RSS 2.0 feed. You can leave a response, or trackback from your own site.